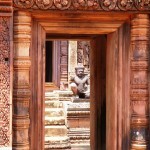 The most popular attraction in Siem Reap is by far visiting the wats spread around in the area. 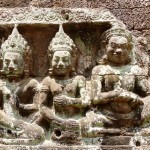 They represent the ruins of the ancient Angkorian capital cities of the Khmer Empire, from 9th till 13th century AD. 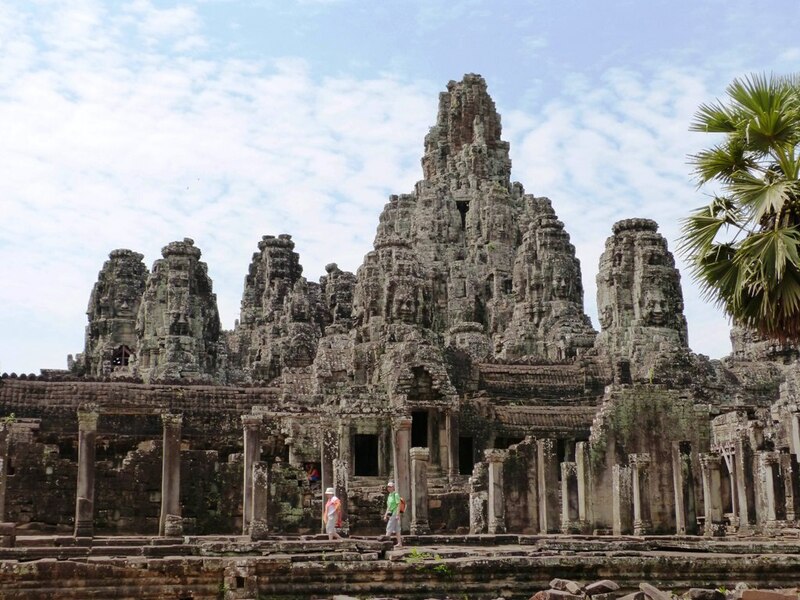 Declared an UNESCO site, The Angkor Archeological Park covers an area of over 400 square km and contains dozens of temples, as well as basins, reservoirs, canals and of course communication routes. 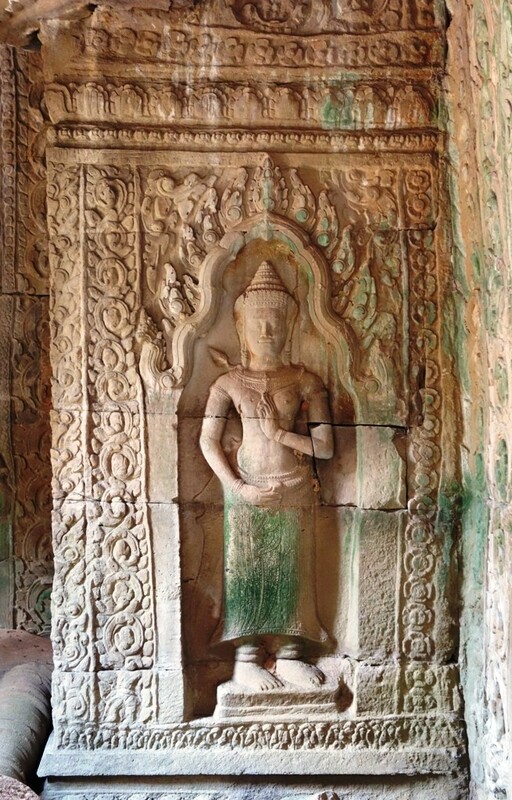 Many of these temples have been restored; some that were kept untouched on purpose, like Ta Prohm, have to now be worked on in order to preserve them. 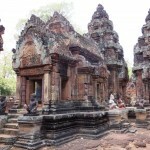 With some exceptions, most temples are in a range of 5 to 25 km from town so they are easily reachable by tuk tuk or bicycle. We chose the former, since we wanted to go to some places further away and the high temperature outside was not very friendly for bicycle riding. You need to buy a pass in order to be able to visit the site. 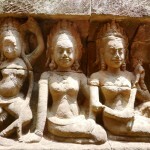 They are sold at the main entrance, on the way to Angkor Wat. There are three types of passes you can get: a one day pass, a three day pass (valid for a week) and a seven day pass (valid for a month). If buying a multiple day pass, do not forget to go by a ticket check booth every morning and have your ticket punched for the day. I found it interesting that they picture stamp the tickets, but the process is quick and you don’t need to have a picture with you, they will take it on the spot. We chose the three day pass, and found it to be the proper amount of time for us. 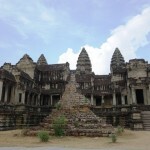 We got to see all the must see temples and also go to a site 50km away from Siem Reap, but didn’t get templed out either. 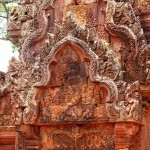 The recommended tours are the Grand Tour circuit, the Small Tour Circuit and then some one-shots to places further away, like the Roluos Group or Banteay Srei. But you can combine them however you see fit, as we did. You can get a map from your hotel or a tourist information center, and go from there. As for the temples…it’s hard to put in writing what you really feel while there. There are so many things to see and absorb and each of them could make for its separate story. 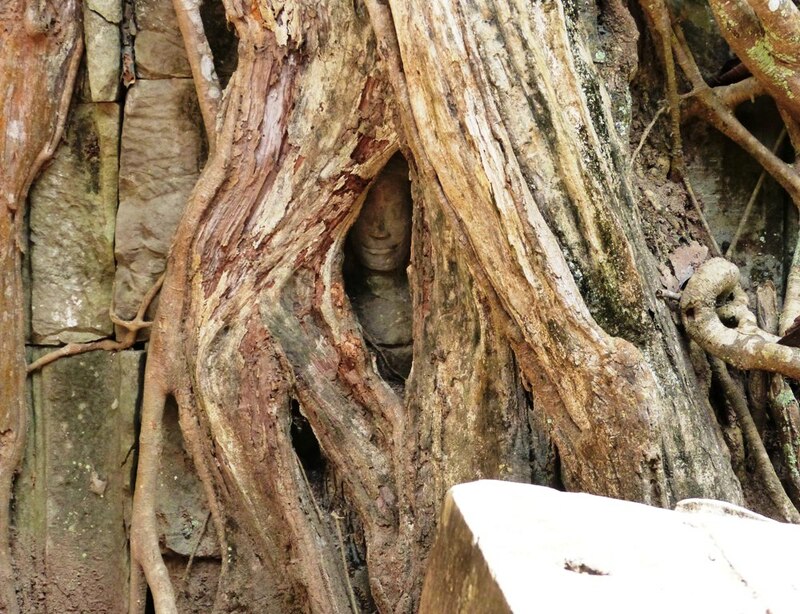 You walk around and look upon these massive ruins, huge towers and walls, and then you turn around and your eye catches these little Buddha statues, hidden under the rumble of rocks and trees. And just like that your perspective changes from being a mouse to feeling like a giant. 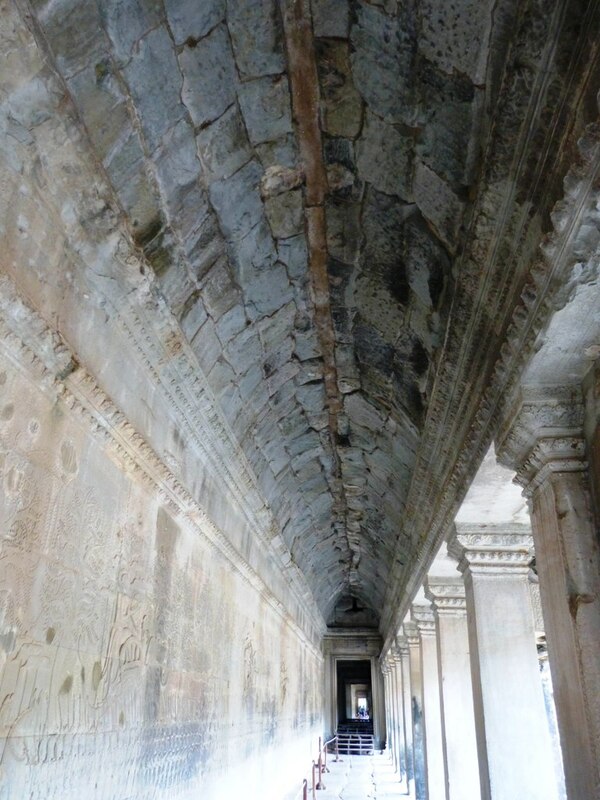 Angkor Wat in itself is breathtaking. Images from TV documentaries and pictures on the internet become alive and you get a little bit speechless with the scenery. The three tiered pyramid like temple, crowned with five towers was designed to resemble Mount Meru, the Hindu sacred mountain, center of the universe and it was dedicated to Hindu god Vishnu. 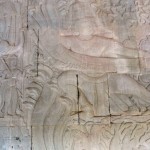 The temple is surrounded by a moat defended by meters long nagas. I probably spent about half an hour analyzing the Churning of the Ocean milk on the east wall. 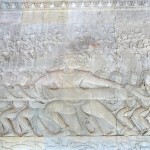 The 50 meters long bas-relief on the east wall is well preserved and it tells the story of the gods (devas) and the demons (asuras) working together to obtain the nectar of immortal life (Amrita). Here is the story in pictures. 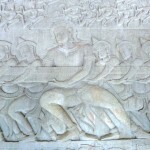 Its head was hold by the asuras while the tail is hold by the gods. 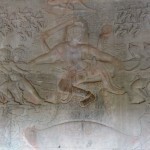 This legend is repeated in many places like over the bridges where the gods and the demons are siting on each side of the bridge pulling on the naga. 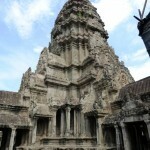 The Bayon, or the Temple of Faces, was my favorite. 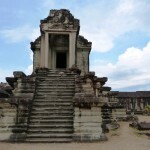 The 37 standing towers of this temple feature faces of what scholars think to be portraits of Jayavarman VII, the builder of the temple, Buddha faces, or a combinations of the two.The faces are still to be fully counted, as not all towers have the same number of faces, they range from one face to four faces, and because some of them are not very well preserved.The temple looks a bit of a rumble, partly because of the age but also because it is one of the temples built in a piecemeal fashion for over a century. 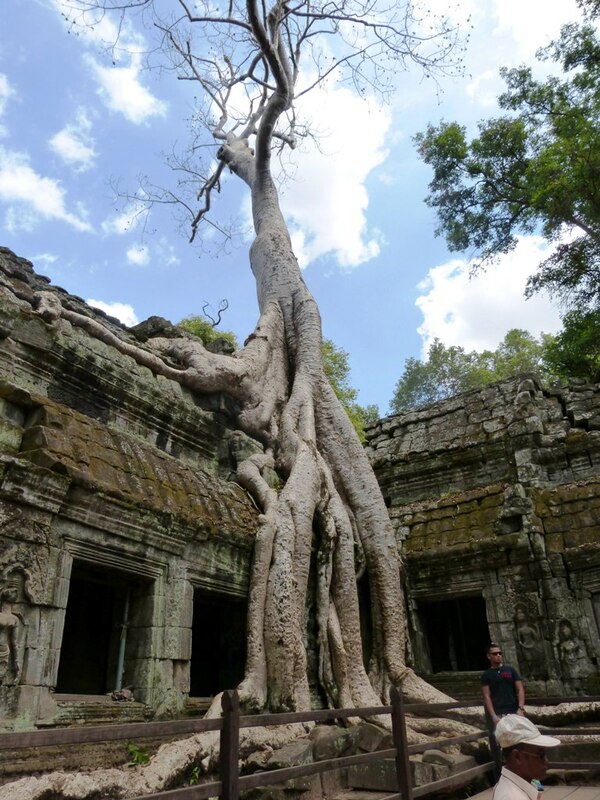 Ta Prohm was Ryan’s favorite. 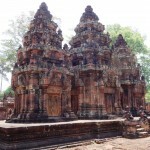 The temple was preserved as it was found, taken over by trees and vegetation. Some restoration work is undergoing though, as nature became a little bit too greedy and the temple needs to be reinforced. 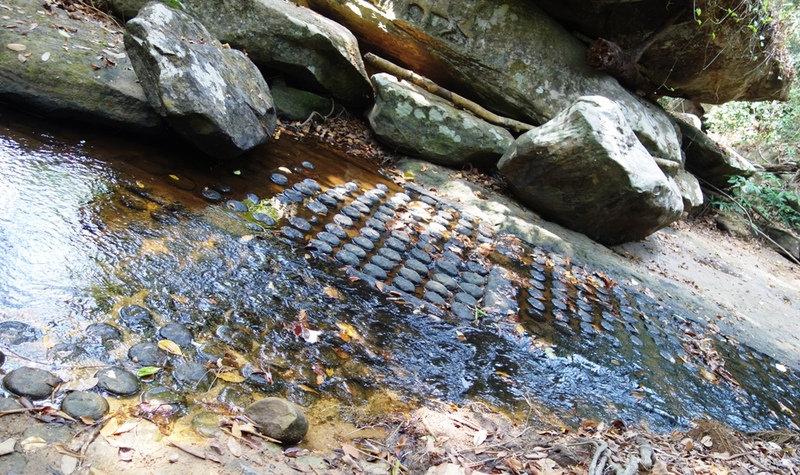 It’s amazing to see how rocks are hold in place by the tree roots and in return the tees can hold themselves tall and straight above the rock bed. You can get lost in here, with so many wall courtyards inside bigger wall courtyards. 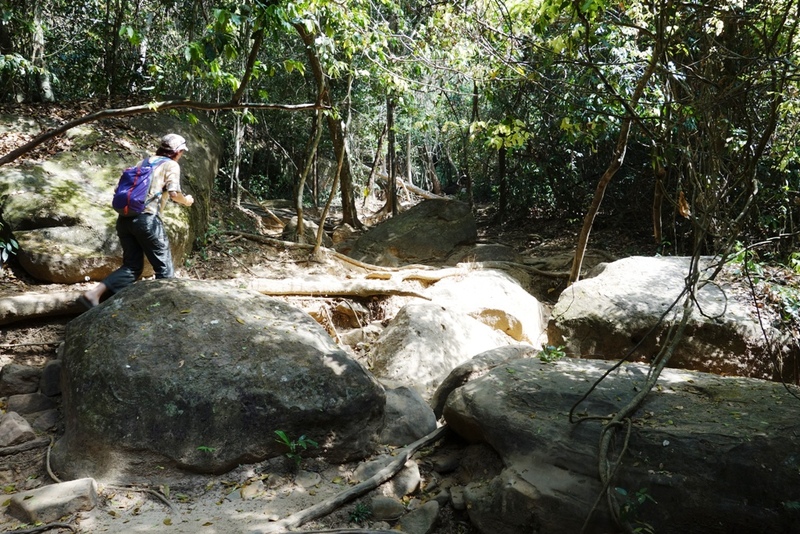 The bigger trip we took was to Kabal Spean, a waterfall some 50 km away from SP. It is a good place to go too, very rewarding and more off the beaten path. Prepare for a walk that will make you sweat like a pig (well, do pigs really sweat?) although it is just one kilometer long. But it is steep and it is very hot. When you get to the top though you forget all about it. The waterfall is not that impressive, especially if you get there in the dry season.It is what you discover there that is worth your time. Ancient people decided that this small river will be a good one to be made holy and use its water to clean your sins away. 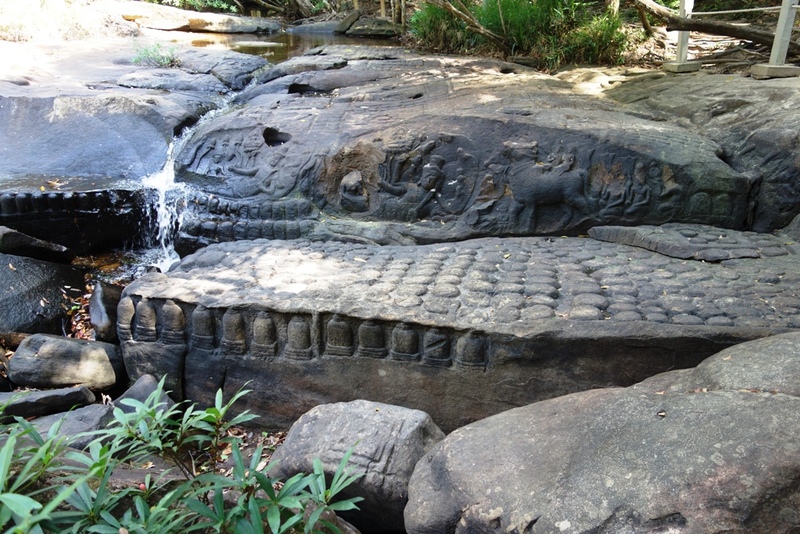 They did this by engraving the rocks around with images of Vishu and Shiva, in their different avatar forms, as well as by creating a thousand lingas in the river bed. It’s eerie to see these hundreds years old mounds still peeking out of the water. 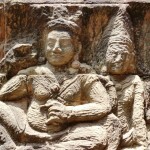 On the way there, or back, stop by Banteay Srey, the wat built by the women. Its pinkish color along with the delicate engravings on the walls is what makes temple stand out from the others. 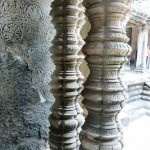 Another place we liked were was the Terrace of the leper king, with its inner walls adorned with asuras, devas and apsaras, reflecting different stiles of carving, from rough chiseling to very delicate details. 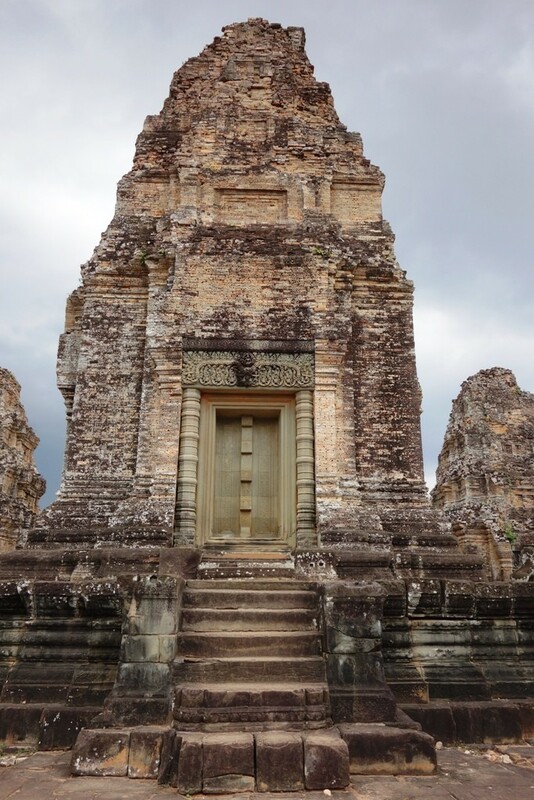 Worthy of mention is East Mebon which stands out from the others because it is made out of bricks instead of stones. While walking around we saw all these little holes in the bricks, not necessarily very regular but so similar that we dismisses the option of the wholes being made by some type of animal. We then thought they might have been done by somebody trying to deface the place, which would have been very sad. Fortunately we found out later that the whole were done on purpose by the builders, preparing the brick for an outer stucco. The stucco never made it on the walls, be that because the king that ordered it was no longer a king or they ran out of money and time. Do not miss this place. It is worthy of your time and money. 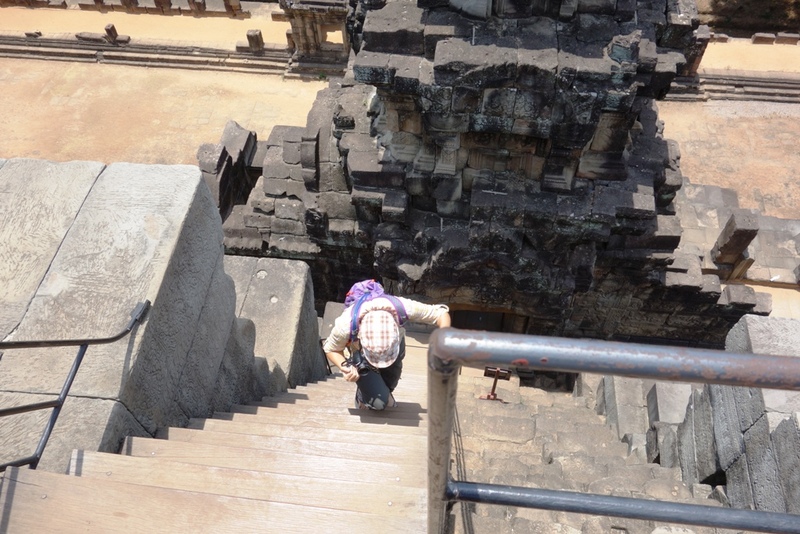 Prepare for being hot and for long stone staircases that sometimes feel like never ending But do go. And enjoy Siam Reap while there. You can see some of the things we really enjoyed there in this separate post we have written.